Writing in May 1915 to apologise for his absence from a Liberal meeting in his Cornish constituency, Thomas Agar-Robartes MP headed his letter with a somewhat unusual address: ‘In a dirty ditch somewhere in France’. Commissioned as a second lieutenant in the Royal Bucks Hussars in August 1914, he had transferred to the Coldstream Guards in January 1915 in order to be posted to the Western Front. Promoted to the rank of captain, he died on 30 September 1915 from wounds sustained in action near Loos in France some days earlier. A memorial in Lanhydrock church, erected by his political mentor Lord Rosebery and other friends, recorded that he had been injured while ‘rescuing a wounded comrade under heavy fire, for which exploit he was recommended for the Victoria Cross’. Agar-Robartes is buried in Lapugnoy Military Cemetery near Béthune. Born in 1880 and educated at Eton and Oxford University (where he was an accomplished polo player), Agar-Robartes had considered an army career, but instead followed in the footsteps of his father and grandfather to sit as a Liberal MP. His entry into Parliament did not, however, go entirely smoothly. At the 1906 general election he was returned for Bodmin with a sizeable majority, but his opponents challenged the result with an election petition, which contained 108 charges of bribery, treating (the provision of food, drink or entertainment to voters) and other corrupt practices. Agar-Robartes was unseated in June 1906 on the grounds of corrupt treating, which included a garden party held shortly before the election contest at his family’s seat at Lanhydrock. Much of the blame for this setback to Agar-Robartes’ political career was placed on the local Liberal agent, Charles Millman. One of the election judges remarked that ‘as to the Lanhydrock garden party, how any sane person could give advice to the father and mother of the candidate to hold such an entertainment on the eve of an election passed his comprehension’. Agar-Robartes himself had bought rounds of drinks for electors in public houses, but the judges accepted that he had not realised this was corrupt. Agar-Robartes explained that this was his usual custom when he went into a pub after hunting or on other occasions and that ‘he always flatly refused to talk politics’ when he did so. The judges did, however, rule that his agent should have warned him against this practice. His unseating did little to dent Agar-Robartes’ local popularity, and indeed the election judges were ‘vigorously hooted by a large throng’ as they left the court after their verdict. He was elected unopposed for the St. Austell (Mid-Cornwall) division at a by-election in February 1908. 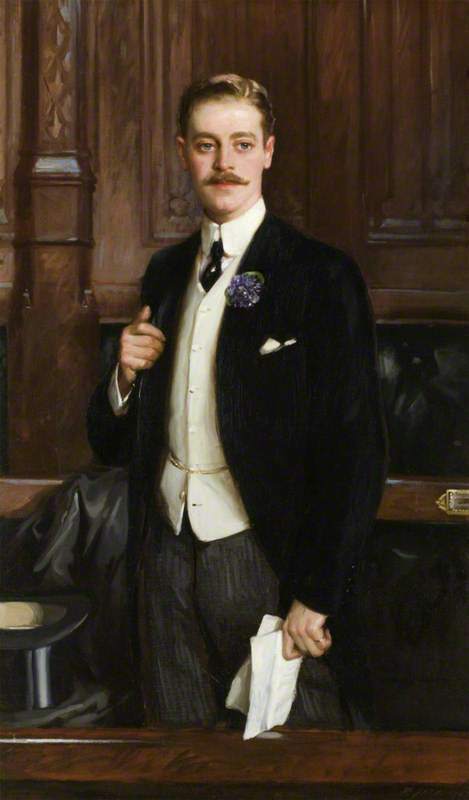 Agar-Robartes earned a reputation as the best-dressed man in Parliament, usually seen wearing violets in his buttonhole. During his first election contest at Bodmin, Lord Rosebery had spoken in his support, and expressed his opposition to the Liberal leader Henry Campbell-Bannerman’s policy of Home Rule for Ireland. Agar-Robartes followed Rosebery’s lead on this, and moved an amendment to the Liberal government’s 1912 Home Rule bill to exclude the counties of Antrim, Armagh, Down and Londonderry from its operation. This was not the first time he had disagreed with his party, having voiced criticism of the 1909 People’s Budget, and ‘his independence saw him drifting further from the Liberal mainstream’. He was, however, remembered by The Times as ‘one of the most popular of the younger generation of members’. For a detailed account of Agar-Robartes’ political career, see Paul Holden, ‘“A very English gentleman”. The Honourable Thomas Charles Reginald Agar-Robartes MP (1880-1915)’, Journal of Liberal History, 66 (spring 1910), 8-18. This entry was posted in 20th century history, military history, social history, World War I MPs and tagged Liberal Party History, WWI, WWI MPs. Bookmark the permalink.